In a perfect world for in-venue content creators, all videoboards would be shaped in a nice and tidy 16×9 aspect ratio. In an industry where everyone is looking for a way to stand out from the crowd, however, it pays to think outside the box. 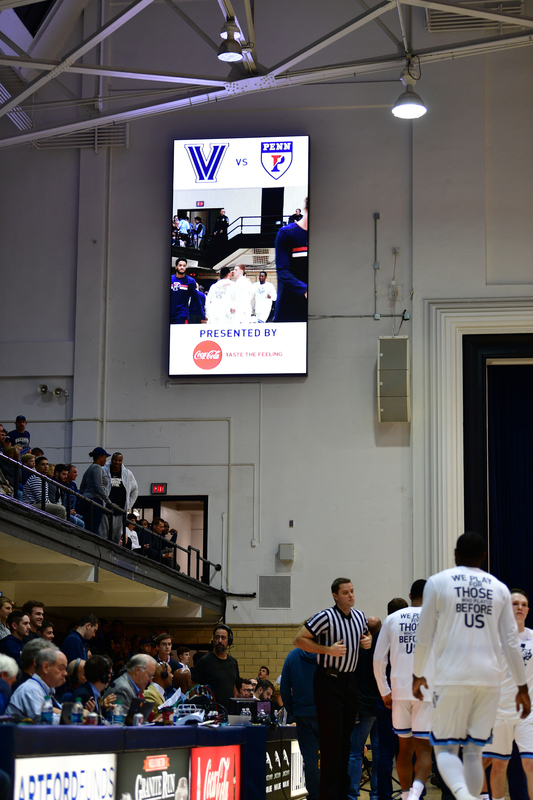 This year, Villanova debuted a unique pairing of videoboards inside the longtime campus staple, Jake Nevin Field House. Villanova’s Jake Nevin Field House debuted two new videoboards this year. Their unique shape has presented new challenges and opportunities for the athletic department’s video team. At a pixel dimension of 272×480, these new boards from ANC look more like a giant cell phone than a mega TV screen, and its created a new set of challenges and opportunities for the university’s athletic department. The dimensions have led to completely altering how Villanova’s video and marketing teams program in-venue content. During typical game action, the board is usually sliced up into three segments: clock and score up top, a square live video feed of game action in the center, and stats or ad space across the bottom. For special content – like pre-game hype videos, starting lineups, or full ad breaks – they use the full area of the board. Technologically, Christiansen has made the most out of some budget-friendly gear to develop creative solutions to the boards’ unique shapes. During a live game, he goes straight from a NewTek TriCaster Mini through SDI directly into the board’s display. With only 4 M/Es available, there’s little room to cut cameras once other necessary elements are laid in. Using a Roland V-1SDI 4-channel Video Switcher, Christiansen is able to take all cameras in and pass it along to the TriCaster as a single source. The near-century-old facility seats only about 2,000 fans and typically plays host to the Wildcats Volleyball team, but with the school’s primary basketball arena (Finneran Arena) under renovations this year (which included a new centralized control room) leading to the women;s basketball team playing there for the entirety of the 2017-18 season. Even the men’s team (which is playing their season at Wells Fargo Center in Philadelphia) played a game against Penn at Jake Nevin.